The following story will appear in the next issue of the Iowa Sports Connection. Back when I was going to school at Iowa State, if you moved your feet at a football game, you didn’t lose your seat, you just ended up in somebody else’s empty seat. Ah, yes, the ‘Die-Hard’ days. 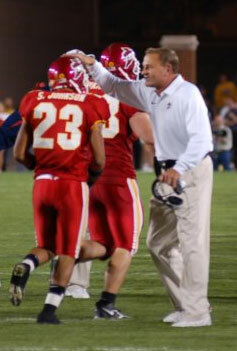 In those years (1993-1997), the football team had records of 3-8-0, 0-10-1, 3-8-0 and 2-9-0. That’s an 8-35-1 record. Talk about miserable. Fortunately I was there to witness this debacle weekend after weekend. If not, I don’t know if I would believe it. I remember after every game, all I could think was 1. Where’s the after game party and 2. Did anyone in the athletic department even care that our football team was the laughing stock of the country? It didn’t seem like it. Especially my first two years. The team was really bad, but the crowds were just as bad too, if not worse. Granted there were some games, such as Iowa & Northern Iowa, where the bleachers would resemble a large high school crowd, but those turnouts were few and far between. I remember most games you could have your pick of seats. So, it was time for a change. After I had passed out, then woke back up again, I realized that in order to reach the next level as a team, we needed to reach that next level as a crowd and as fans as well. I also realized that our team was still pretty bad. Our offense would score 24 points per game on average, but our defense allowed 37 points per. So when people started coming back to watch the not-so-mighty Cyclones, it was a good thing. People once again had hope. Davis’ rushing abilities helped feed that. The few more wins helped feed that. 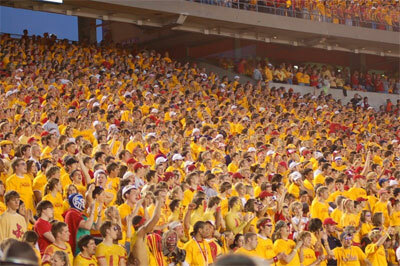 Dan brought courage, determination, and a love for everything Iowa State, that people just couldn’t resist. It was contagious. We finally felt like there was somebody on our side. Somebody who would fight the fight every Saturday and enjoy the good times with us and use the negatives to get better if things didn’t work out as originally planned. 10-plus years later, Dan is still about everything Iowa State. But if you move your feet at a game these days, you will lose your seat. Back-to-back home attendance records will attest to that. You see, there is more help in town in the form of Jamie Pollard. More hope too. Dan did the heavy lifting, Jamie’s here to tone and shape. So when we look up and see Jack Trice Stadium filled to the rim, let’s not forget where it all started. It was the hard work and dedication of a coach who, in 1995, took over a team that had finished as the second worst team in the entire NCAA by virtue of our one tie. Did a lot more wins and bowl games come immediately? Nope. But, the thing that did change was the attitude of the football team and the attitude of the fans. I used to get upset when more fans showed up to the game. Now I welcome them all with open arms. I used to get mad at the team when they lost, but not anymore. I feel the pain right along with them. I, as a fan, am part of this team. Dan tells me so. The attendance at our games tells me other people feel like they are part of this team as well. But with all that Dan brought to the table back then, the most important thing to most fans then – and now – is wins and losses. When you add wins, you add fans. When you add bowl games, you add fans. It’s just the nature of the fan. Even great programs with great traditions lose fans when they’re not winning. It’s all in the company you keep. Winners are winners. Losers are losers. 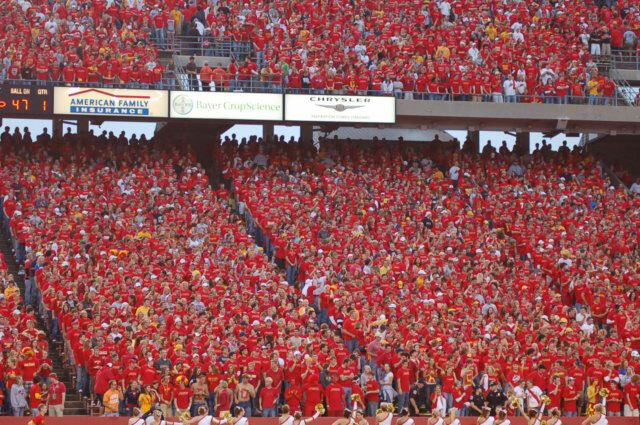 In the first few home games this year, the Iowa State fans have shown they are ready to take this program to an even higher level. But what if we lose a few more games? Will the huge crowds dwindle? My guess is, in order to keep the Jack packed to the max, the ‘Clones need to continue putting a winning team on the field. If that doesn’t happen…well, I guess the die-hards will have their pick of seats again. This entry was posted on October 19, 2006 at 5:06 am	and is filed under Brad's Blog. You can follow any responses to this entry through the RSS 2.0 feed. You can skip to the end and leave a response. Pinging is currently not allowed. Wow ! You took the words right out of my mouth!I started to love college football in the days of Troy Davis!I learned as much as I could about rules and really fell in love with Iowa State.My husband and I enjoy the cyclones every home game with season tickets and for once in all these years people have quit yelling at us for standing and yelling but now stand with us! !Very good write sir!I agree 100%!Keep up good work. Brad, Your my Hero!!!!!! Who did you get to write this for you or have you finally grown up! Oh wait you did already get kicked out of a game this year!!! Well dome Brad, Well Done! Cyclones need to pick it up. AS ALWAYS, GO STATE!!! Well spoken Brad! and by the way how the HELL have ya been? i feel the pain for both the players and fans. I cheer on the Cyclones more than i do the Hawkeyes and feel the Clones should have beat them Hawkeyes. Haven’t seen ya for many years we need to hook-up for some beers!